Coat of arms interpreted with a semi-circular shape; metals or and argent and colors gules, sinople and azur; the delineation is color sable; and a freehand finish. Credits: Rolando Yñigo-Genio is the creator of the coat of arms and Antonio Salmerón y Cabañas is the author of the heraldic art. 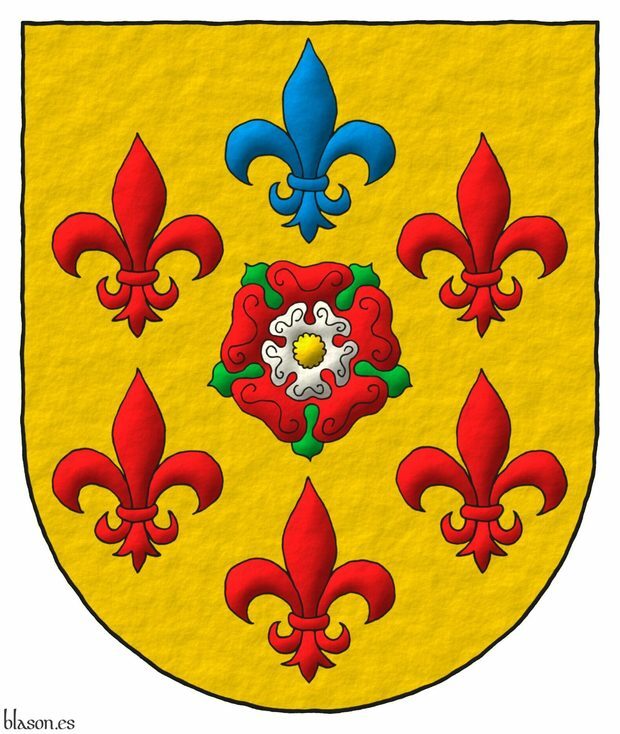 Blazon keywords: Or, Double rose, Gules, Argent, Barbed, Vert, Seeded, Six, Fleur de lis, Orle, Five, One, Azure and In chief. Style keywords: Semi-circular, Freehand and Outlined in sable. Classification: Interpreted, Personal and Coat of arms. Style keywords: Semi-circular, Iridescent, Outlined in sable and Illuminated. 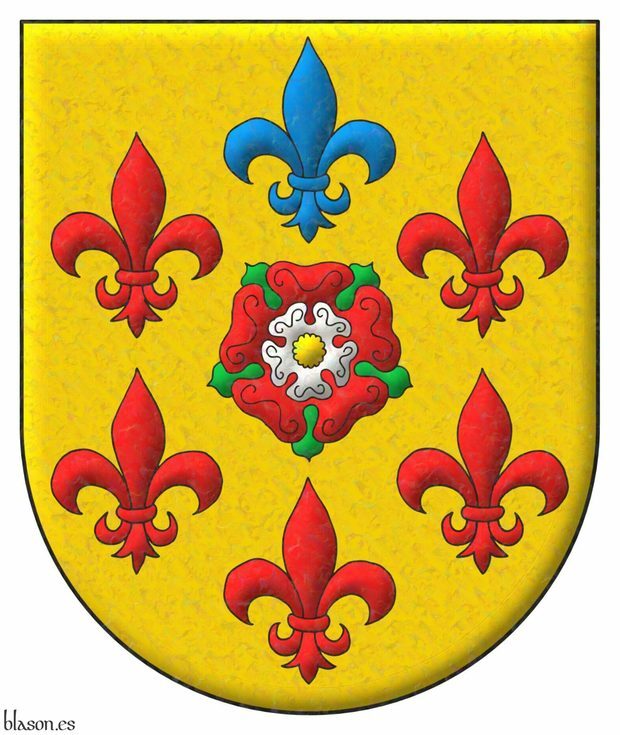 Or, six Fleurs de Lys in orle, five Gules and and one in chief Azure. 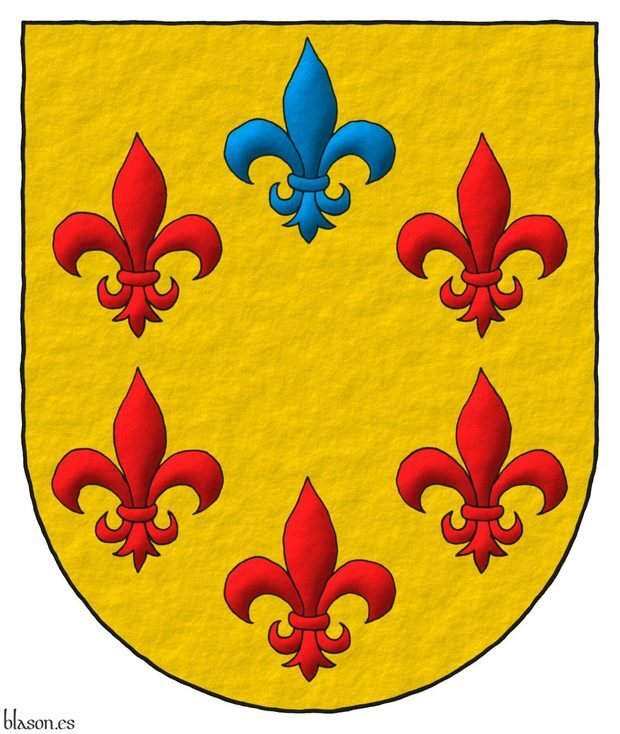 I have interpreted this coat of arms with a semi-circular shape; tintures or, azure and gules; outlined with sable; and a freehand finish. Rolando Yñigo-Genio publish on his website DeviantArt his interpretation of my coat of arms as I publish here in Blason.es I my interpretation of his arms and those of his brothers Noelia Yñigo-Genio and Elias Yñigo-Genio. Rolando Yñigo-Genio is the creator of the coat of arms. Antonio Salmerón y Cabañas is the author of the heraldic art. 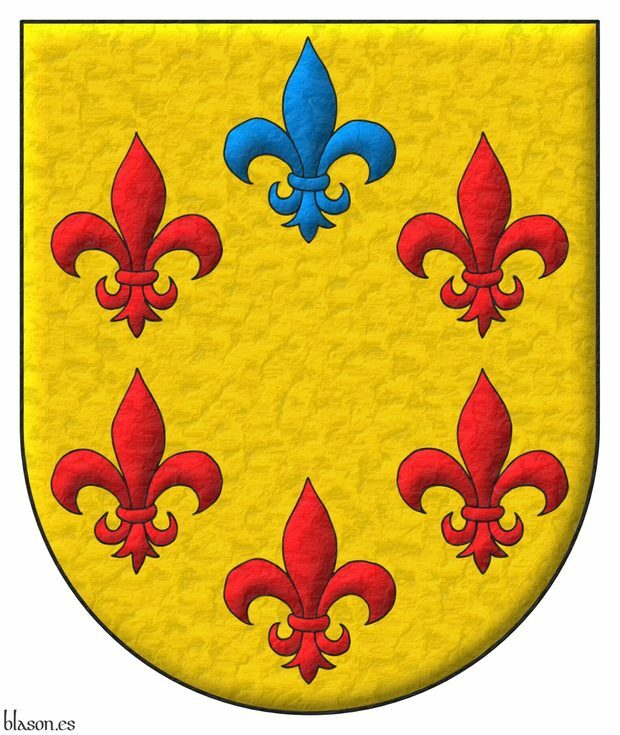 Blazon keywords: Or, Six, Fleur de lis, Orle, Five, Gules, One, Azure and In chief. Escudo de oro, seis flores de lis en orla, cinco de gules y una de azur en jefe. Style keywords: Semi-circular, Soft metal, Outlined in sable and Illuminated. Iridescent, Azure, Barbed, Seeded, Five, Outlined in sable, In chief, Coat of arms, Fleur de lis, Personal, Gules, Illuminated, Interpreted, Semi-circular, Soft metal, Orle, Or, Argent, Double rose, Six, Vert, Freehand, One, Yñigo-Genio, Noelia and Yñigo-Genio, Rolando.